Why do we need a Video, DVD & Blu-Ray Compression Software? You might want to transfer a large Blu-ray video to your smartphone for watching on the go or store more DVD movies on external hard drive for portable DVD Player assuming that you work on an ocean going tug boat and can be gone home for months at a time, watching DVD movies on a Portable DVD Player will help you relax after you shift. It also be better to reduce video size before uploading it to YouTube. All these situations need a Video, DVD, Blu-ray Compressor. Many Video Compressor applications need to pay. But there are still some tools offering free workaround to shrink video size. Below are top 6 free Video, DVD & Blu-Ray Compression Softwares gathered on the Google. Pavtube Free Video DVD Converter Ultimate is an absolutely free and easy to use video converter. It assists you to convert to tons of video & audio formats free and easy, making them compatible with all devices with great quality. Besides essential conversion ability, it also provides in-program editing functions like trimming, cropping, rotating, merging, adding subtitles and watermarks, etc. In addition, it also can batch convert from DVD disc, DVD folder, DVD IFO/ISO to MOV, M4V, AVI, WMV, etc. In "Settings" window, you can reduce video and DVD bitrate to compress the video size. Higher bitrate leads to large video size, vice versus. You also can trim unwanted video footage to reduce video size by remove video length. What’t more, different video format encoded with different video codec also affects video size. Note: Pavtube Free Video DVD Converter Ultimate can’t output MP4 format. If you want to convert video and DVD to MP4, you need to upgrade it to paid one. Pavtube Free DVDAid (Mac) offers every user the opportunity to rip, encode and edit DVD to almost any video and audio format freely. Without extra payment, you could own a freeware to assist with DVD to video/audio transition which enables you to watch DVDs on other multimedia players without limitation. 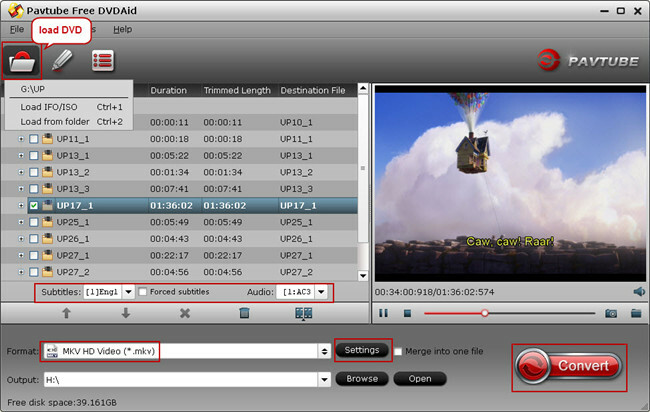 Plus, with the built-in video editor, Free DVDAid is considered to be an easily handled video editing tool with the ability of trimming, cropping, splitting, merging, adding subtitle file, etc. You can compress DVD by converting DVD to lower resolution or lower bitrate video files and split video to several video clips. You also can trim video length to cut the unwanted video files. Note: Pavtube Free DVDAid can’t output MP4 format and disc copy DVD. If you want to convert DVD to MP4 or directly copy DVD, you need to upgrade it to paid one. Handbrake is a free video converter that’s well known to Windows & Mac users. There are a lot of features that allow for fine-grained control of video conversion – including very precise cropping, advanced filtering, frame rate adjustment – but there are also presets for those who just want quick results. Handbrake may take a while to get used to, but the output is worth it. Handbrake supports to convert DVD to MP4 and MKV to compress DVD video size. 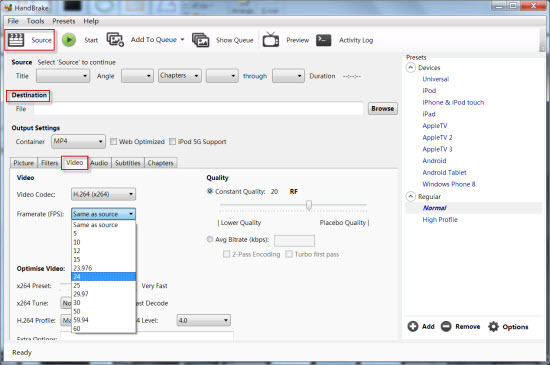 You also can use Handbrake to convert other video files to MP4 and MKV then reduce bitrate to reduce video size. Please notice that, if you want to shrink protected DVD with Handbrake, you need to install libdvdcss. You’ll need .NET 4 (only the client profile is needed). If you don’t have it, VidCoder will prompt you to download and install it. If you’re on Windows 8 you shouldn’t need to install anything; it has .NET 4 pre-installed. QWinFF is a GUI for FFmpeg, a powerful media converter. FFmpeg can read audio and video files in various formats and convert them into other formats. QWinFF features an intuitive graphical interface and a rich set of presets to help you convert media files within a few clicks. Advanced users can also adjust conversion parameters in detail. Pavtube Video Converter Ultimate (Mac version) is the best video/DVD/Blu-ray compressor running entirely in the Windows PC. No matter the format or size, you can shrink your videos using this Video Compressor. It accepts a wide range of video formats including TS, Tivo, PVR recordings, AVI, Blu-ray, DVD, ISO, VOB, M2TS, MOV, DIVX, FLV, 3GP, MP4, WMV, VOB, or MKV, and reduces their size, resulting in HEVC, MP4, WMV or FLV, etc videos. This compressor comes with default settings it selected to give you the best balance between video output quality and file size compression. You can also customize videos further and decide on the video compression that best suits your needs. Smaller videos are easier to share and faster to upload. This video compressor offers multiple output formats. Videos can be processed in batches for large workloads. An extremely flexible and streamlined user interface. 30X faster in encoding video to HEVC with NVIDIA CUDA acceleration.